After not quite doing the job Henman and Murray style with Virtua Tennis 3 and VT2009 on this generation’s consoles can Sega’s arcade tennis classic still cut it? Thanks to a long awaited upgrade to the World Tour career mode, they’re in with a fighting chance. Before getting stuck into the World Tour mode you might want to warm up with a few exhibition matches. The leading names of modern tennis are all present except for one of the Williams sisters for some reason. The PS3 has a few exclusive classic characters too, leaving the 360 version with a comparatively small roster. There isn’t particularly much scope for extra players via DLC either as the favourites of Nadal, Federer, Murray, Sharapova and so on are all present and tennis isn’t exactly brimming with superstars like the WWE. On the court, the game initially forces you to play an offensive net game as baseline attacks can just go on forever until you’re really good at them. There’s a lot of emphasis on getting into position early and holding down the strike button (topspin, slice or lob) for longer to get more power on the shot. It’s a long way from simulation, but if feels less arcadey than in the past. More annoying is the player’s hesitancy to just smash the ball, as they so often just pat it over into their opponents side when you want them to leap and attack. The rallys often exceed thirty shots and it makes you wonder why the score doesn’t remain on the screen because you’ll definitely forget what it is during these epic bouts. It’s good to take a breather then with the party minigames that accommodate one to four players. Ace Striker has you serving into soccer goals between defensive walls and moving goalies. Bomb Match has a timer on the oversized bomb-ball that you play against an opponent, hoping it’ll explode in their face when the timer reaches zero. Extra seconds can be shaved off by hitting numbered targets on the ground. Wall Matches feature pads on the floor that bring up sections of wall above the net, making if difficult to return the ball for both players. The quickfire nature and random placement of the pads keep these games very entertaining. Clay Shooting is a shooting gallery with moving plates, Egg collector is a running game where you collect chicks from eggs and try and guide them back to the barn without the ball cannons or snakes getting them. Royal Poker puts fives cards at the opposite end of the court for you to hit to deal a fresh card in the hope of gaining a flush or other winning combination. Wind Match has ever-stronger winds coming from the side or back of the court with the opposing players actually having to work together to keep a rally going for as long as possible. Coin Matches involve collecting coins while returning shots. If you win the point you’ll get even more coins dropped on your side to pick up. Unfortunately, in single-player at least, your opponent is so tough you have to rely on the slow drip-feed of single coins. It’s much more fun in multiplayer. The last game of the bunch is Pin Crusher, which is basically bowling. Unfortunately some of the pins appear to be randomly nailed down as the wonky weighted physics make a mockery of your efforts. On your road from nobody to ultimate superstar you’ll get to travel the world to see if you can reach your lofty ambitions within four short seasons. Enter matches and take time out for your fans and charity to earn Stars to climb the rankings, but remember to keep your time balanced with your training. The rotating world map has thankfully gone and has been replaced with something resembling a board game. You follow a route with various stops such as matches, minigames, charity events and fan signings. You travel between them with travel tokens that move you forward a specific number of slots between one and four places. You always have at least three random tokens as they’re constantly handed out. Occasionally the path will branch off in multiple directions and you’ll have to plan your route out looking for what suits your needs the most. Should you go left for lots of Star earning press junkets or catch up on some training? Hotels will top up your condition (match fitness) while accident markers must be avoided for obvious reasons. Keeping on top of your match fitness is one of the most important aspects, especially when entering a multi-stage tournament. Unfortunately the same amount is drained in a match whether it’s a close one or if you don’t lose a single point, which is a shame. It makes sense to get good at the party minigames as they make up the training modules where you level up your stats like strokes, footwork and stamina. You don’t get much direct control on how you want to level up and it takes a while before you notice any difference at all, but after a while this helps to unlock the Play Styles menu. 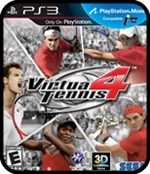 Choose a Play Style after reaching the required level and you can look forward to unleashing one ofVirtua Tennis 4’s new features, the Super Shot. A metre must be filled up by playing in the style you choose. Ground Stroke specialists must attack from the baseline, while Aggressive Volley players attack the net with powerful shots; once the bar is full you can use your Super Shot to unleash, well, a Super Shot. It’s basically a much faster shot that, if used when your opponent is off to one side, is almost unmatchable. It’s not as over-the-top as an EA Street-style Gamebreaker, but it does give you a bit of a boost when you need it the most. Interestingly, the fuller the Special Shot bar is, the more likely your player is to make the extra effort with energetic smashes dramatic diving shots and maybe some other moves relevant to their style. The strategic movements around the World Tour Map turn out to be a great addition to the series once you get used to it. It could have been a smoother experience though, as you have to go into a separate map screen if you want to look at what each event actually entails instead of the one used to actually travel to locations. It’s unnecessarily clunky, especially when you want to look at split routes. It’s good to see the main meat of the game performing so well. But there are a few areas that let the game down. Some of the likenesses are a bit rushed, Andy Murray and Nadal being particularly unimpressive and the less said about the sinister gooey white sweat that suddenly drips off player’s faces during the victory animation the better. The character creator isn’t on form either, there are loads of customisation sliders for facial details, but most of them don’t seem to have any visual impact whatsoever. The music is terrible. Thankfully you can play music off your hard-drive (yes, even on PS3), or as I found best, podcasts, as the game will run them interrupted even through (the mercifully quick) loading screens. Plus, some of the rallys are so long you’ll be grateful for the distraction from grunting and ball thwacks. PlayStation Move functionality should have been a winner here. But it’s terrible. The gameplay changes to a semi-first-person perspective when the ball comes towards you as you swing for the ball. Shots seem to only want to go far left or right, you’ll sever your spine in efforts to get the lob to work and the net rush feature doesn’t work at all. You can only play exhibition matches or one of two exclusive minigames that would have fared better in the regular game. Why they couldn’t have left the viewpoint as normal and either automated the player movement, or assigned it to the navigation controller? I personally haven’t tried the game with Kinect, but from all reports I’ve read, it’s just as bad, if not worse. We know these devices work, but they’ve not been treated with any respect here. Thanks to PSN still being down at time of writing I’ve no online review for you. While we wait for that, the game has done a great job with multiplayer with matches being more entertaining than the baseline camping the AI sometimes goes for and the party games work better with friends too. 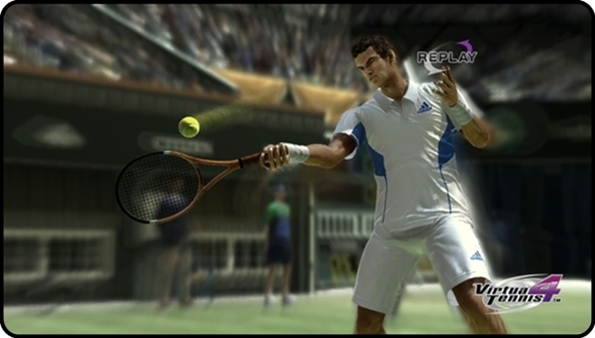 The Short Version: Thanks to the much improved career mode, Virtua Tennis 4 is a winner. You know a great sports game when you enjoy playing it, despite not really caring for the sport itself (years of Henman and Murray will do that to you). Don’t worry about the crappy motion-control, when the pads can do it so much better. It’s the first VT game since VT2, that I’d recommend buying rather than renting.